Daily married life, thus far, hasn’t proved to be an entirely different experience than when my husband and I were just “boyfriend-girlfriend.” I take comfort in that. However, one subtle shift has taken place: buying things for the home. Unless I purchase something completely personal to me that doesn’t wipe out our savings, everything else is a “joint purchase.” There are those little words again: we…us…ours. Something that has been on my list for some time now is a blender. We have an outdated crappy one, albeit with a glass carafe. That was about its only redeeming quality. The hubs could not understand why we needed one. He kept insisting that our old one worked just fine, despite the fact that anytime he even wanted to make a protein shake, of which the ingredients are powder, ice, and milk, he would have to physically shake the blender while it was on to assist in shifting the ingredients around in the pitcher. Not ideal. In researching blenders, I came to find out that along the blending spectrum, there is a sharp increase in price as blending technology improves. You’ve got your $30-40 Cheapo brands, which means purchasing one equates to throwing one’s money in the garbage, your mid-priced brands with name recognition–and decent-but-not-great blending functionality–in the $70-150 range, and then you immediately surge up to the $400-600 blenders that promise to change your life FOREVER, which of course means it’s a VitaMix, the Holy Grail of blenders. Not sure what the issues are in blending technology that it takes making a blender that costs someone upwards of $600, but apparently only the wealthy (or irresponsible spenders) are allowed to benefit from it. It looks like a regular blender, right? But….$500? As I had no desire to spend an entire year of my life saving up for a blender, we did what most people do: scrounge around for a 20% off coupon from Bed Bath & Beyond and hope they have something decent in the mid-priced range that will do what it’s supposed to do. Aside from being slightly disappointed at the lack of inventory in stock (and then remembering that, including myself, most people are buying items online nowadays), what surprised me was that blenders with glass pitchers have now gone the way of the black rhino–only a few are in existence. The only one I saw was a $40 crappy one that I staunchly avoided. Sadly, everything is plastic now, even when you are willing to spend $100 or more on an appliance. I am sure the savings are passed on to the consumer but if I had my druthers, I prefer glass and would pay a little more for it. Aside: my dear father, who is rather old-fashioned, was aghast at this plastic-carafe news when I told him about it. He suggested I try finding a replacement glass pitcher for the Ninja Professional 1000. I love that guy. Moving along. 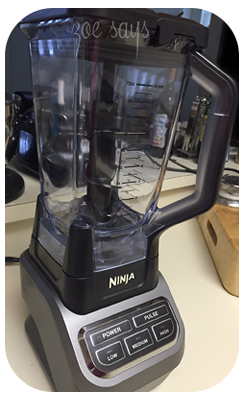 We had done our proper reviews research (promptly ignoring the one-star reviews from those people who don’t know how a blender works or were mad that the box was dented when it arrived) and with a little leap of faith, we invested in a Ninja–the Professional 1000, to be exact. A Ninja blender sounds straight out of SNL or Made-for-TV Land, but it is, in fact, a legit brand. This thing has three tiers on the blade and when it’s on, there is no doubt that something is being pulverized. Admittedly, it’s loud, but it works. After the first go around with the blender, in which my dear husband overfilled it and we had a near disaster on our hands, I took over the smoothie-making in the household and lovingly demonstrated the proper proportion of fruit to protein powder to ice to liquid. Since the implementation of successful blended drinks has taken place, we are blending fools, making one healthy smoothie after another. Our little Ninja is proving itself to be quite the decent purchase, thank me very much. A successful foray into Joint Married Purchases, if I do say so myself.